Bethesda and the surrounding area has no shortage of cultural institutions. After all, residents are just minutes from one of the cultural capitals of the world, Washington DC. Still, not every trip to take in a bit of history or art requires a visit to The District. One of our local favorites is the National Museum of Health and Medicine (NMHM), located in adjacent Silver Spring, Maryland. 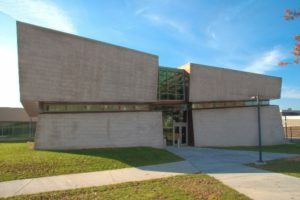 The museum, which has gone by several different names in its more than 150-year history, traces its founding to the Civil War. It opened in 1862 as the Army Medical Museum with a focus on studying injuries to soldiers and the development of new treatments. At other points in its history, it has focused on cataloguing infectious diseases and even became involved in public health campaigns. But we turn back to its origin—the Civil War—to provide a glimpse of an enduring permanent exhibit: Civil War Medicine. As you might expect, medical practices have changed dramatically since the 1861–65 conflict between the Union and the Confederacy. In particular, the treatment of gunshot wounds was foreign to most doctors at that time. The destructive powers of new minie balls had devastating effects. Yet many would die not from a lack of surgical care but from the absence of efficient transportation, hospital facilities, and the rampant infections resulting from use of unsterilized instruments and limited sanitation. Within its collection, the NMHM museum contains an array of artifacts—including human bones that clearly show the wounds caused by mini balls. While it may seem like a grisly collection, the components served a critical purpose in academic study of war injuries. The exhibit also features historical illustrations and photographs of specific injuries or surgical rooms, at times pairing the weapon, like a cannonball, with its aftermath, a broken tibia. In many instances, such as this one, the injury is tied to the narrative of a specific soldier. Major General Daniel E. Sickles of the Union Third Army Corps endured the broken leg but survived, following an amputation. These narratives of individual soldiers help demonstrate the progress of medicine, and offer insights into life as a soldier, before, during, and after being wounded in battle. The NMHM exhibit may be the best opportunity to unwind a number of myths about Civil War medicine, such as anesthesia-free amputations and other unspeakable procedures. 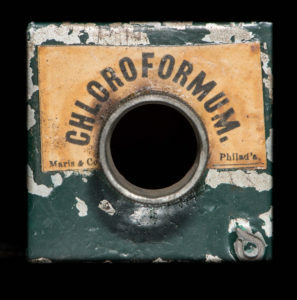 In fact, ether and chloroform had come into use in the years prior to the Civil War, providing a basic but effective means of rendering a solider unconscious before the six-minute procedure. Some 80,000 operations by Union surgeons alone used anesthesia. The availability of anesthesia even made reconstructive surgeries possible for the very first time. The NMHM exhibit details stories of soldiers, such as that of Private Carleton Burgan, who had several facial reconstructive surgeries after a serious infection, and afterward was able to live a normal life with limited disfigurement. 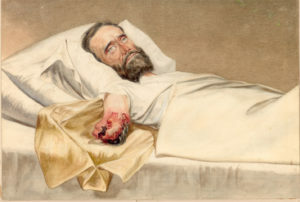 Development of prosthetics, a natural result of years of wartime amputations, further showcases the advances that followed treatment of Civil War casualties. ecause of regular infections, the product of difficult conditions and poor hygiene. The slow, brutal drama of soldiers dying of dysentery, typhoid, or pneumonia provides a much broader picture of wartime maladies. The NMHM museum also highlights the impact of women like Clara Barton, Dorothea Dix, Sojourner Truth, and Harriet Tubman, all of whom served as nurses during the Civil War. Mary Walker also became the first women to work as a contract physician for the U.S. Army. These women, as well as many other nurses, defied expectations that they would be unable to handle the grisly nature of work in field hospitals. It is these less-considered aspects of Civil War medicine—the need for urgent transportation, post-injury care, and more robust health infrastructure—that expand the portrait of medical practices during this era and their impact on the practice of U.S. medicine in subsequent years and decades. Additionally, the NMHM allows visitors to continue the journey through history, taking in other exhibits on wartime medicine in conflicts as recent as the Iraq War during the 2000s. While NMHM exhibits reflect the tragic consequences of human incivility, they also trace the medical innovations that, for thousands of soldiers, have meant the difference between dying and surviving on the battlefield.